Despite the fact that I love a complex, swanky meal and can twist my brain in knots dreaming them up, I have long aspired to a simpler life. Meals involving minimal ingredients, prep, equipment, time, money. I recognize that my simple is different from a lot of people’s simple, but it’s all relative, isn’t it? And lately I have achieved some true simplicity in dishes that have surpassed my expectations in flavor, ease and overall satisfaction. So I am creating a new category to house these gems so that I can browse them occasionally and bring myself back from the brink when I need it most. Please note all photos are sadly unfabulous phone photos as part of this simplification means missing any sort of good light in winter and, really, I just wanted to eat already. 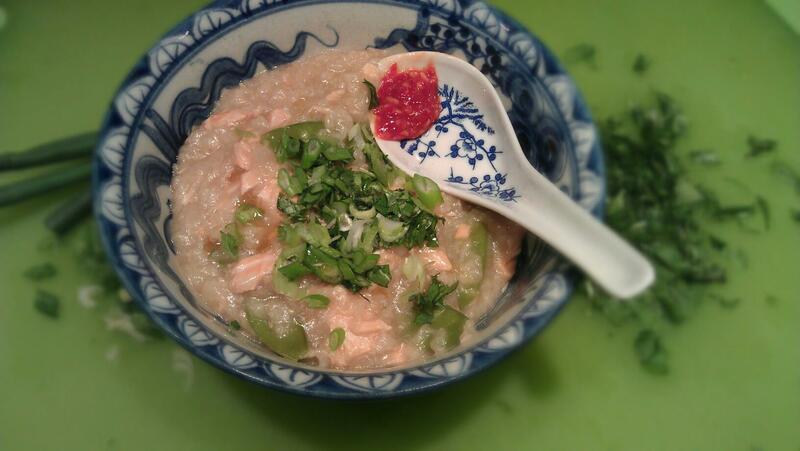 The first truly great meal that fit this new mantra perfectly was a salmon congee. Congee is a thick, velvety rice porridge often served for breakfast or, like chicken soup, offered to the sick as a mild, comforting dish. It can be served simply or with a variety of toppings. On this occasion I decided to go as simple as possible and cook it all together in rice cooker which, handily, came with a porridge setting. I feel pretty sure this setting just allows the porridge to cook longer so that the rice can break down….but I was just winging it, so I am not really sure. A few brief searches for rice cooker methods revealed some passionate debates about the proper congee methods. Many people (including Mission Chinese Food’s Danny Bowien) will cook it overnight either in a slow cooker or in a gentle simmer on the stove. But there were some real advocates of the rice cooker so I gave it a go. I rinsed 1/2 cup of sticky white rice several times, then added 2 cups chicken broth and 1 cup water and a couple nubs of ginger. I started the cooker and after about 30 minutes added some oyster sauce and chunks of fresh salmon. I let it cook another 20 minutes or so putting a paper towel on the steam vent when it began to gurgle and spit starchy ricey, salmony water out of the top and stirred the mixture a few times throughout. When the texture was similar to oatmeal I added a handful of sugar snap peas for a couple minutes then ladled the lot in a bowl. Topped with a drizzle of sesame oil, chili garlic sauce, some green onion and cilantro, it was elevated to a bowl of comforting perfection. It made about 2 1/2 hearty portions, came together with very little effort and was exactly what I had hoped for. You can do the same thing with chunks of raw chicken or could also top the finished porridge with some leftovers. I intend to try something similar with different grains as I try to eat less and less white rice. The next meal I was feeling pretty good about is arguably not so simple for some as it involved lobster stock from my freezer. But for me, this is what preparedness is all about. Take some time on a Sunday to make a huge vat of stock and you will be blessed many times over with a decadent base for any number of meals that can come together quickly and impressively. On this night, I reduced the broth a bit and stirred in some white miso. I sliced a couple zucchinis into noodles and salted them while I quickly and hotly cooked some carrots and jalapeños. 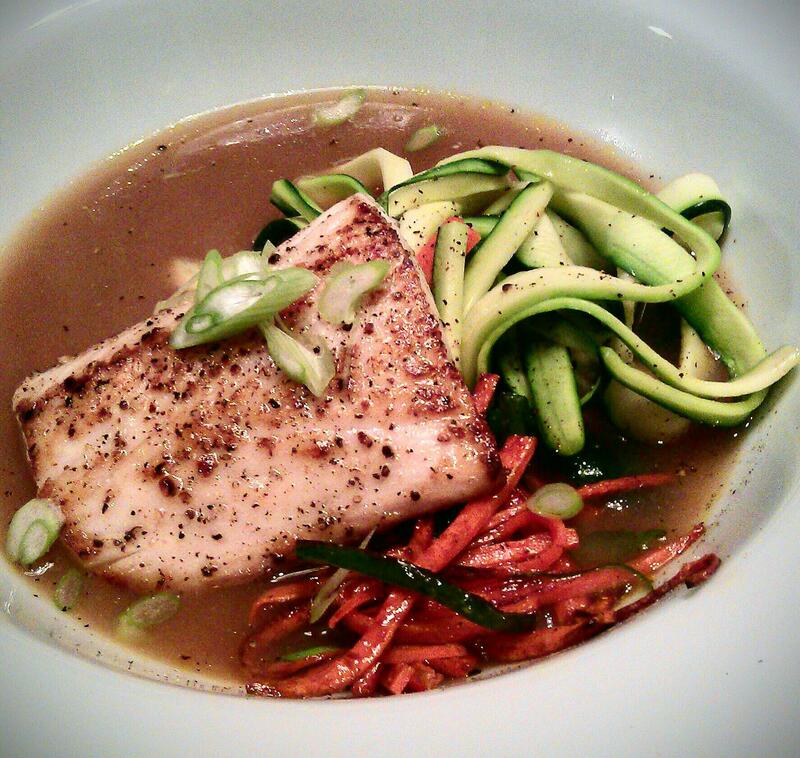 I then seared mahi mahi seasoned with just salt and pepper in the same pan and put it all in a bowl for some dreamy and healthy slurping. 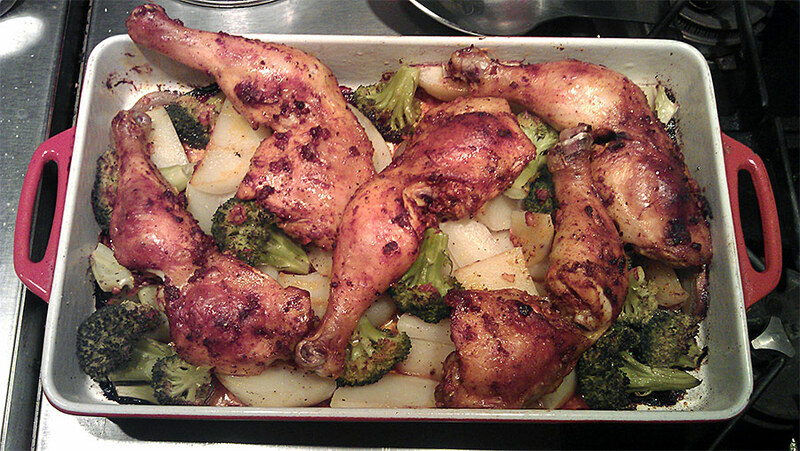 The final meal constructed itself out of things I had on hand: a pile of whole chicken legs, a few red potatoes, some broccoli and a sad, little tangerine. I knew I wanted to try to do dinner in one dish or bubble it up in a soup and settled on layering it all in a baking dish and throwing it in the oven. Around lunch time I decided I wanted a marinade or rub of some sort instead of just salt and pepper and went down to assemble something. The first thing I saw was a jar of garlic cloves that a friend had gently cooked in oil until they were soft and mellowed. I took about 8 cloves and smashed them with a knife, then mixed them with some achiote paste, cumin, chile powder, salt and pepper and the zest and juice from that sad tangerine. I rubbed the legs with the marinade until my nails were certain to be stained orange and threw it back in the fridge. At about six I peeled and cut the potatoes and tossed them with broccoli and some sliced shallots and put them in a lightly greased baking dish. I topped it with the legs, covered it with foil and cooked it at 450° for about 30 minutes. I then removed the foil and cooked it another 30 minutes until the skin was deeply browned and crisp. The juices and fat had bathed both the potatoes and broccoli in some incredible layers of flavors from the garlic, orange and soulful chicken fat. And I once would have cringed at a soft broccoli which, in earlier experience, would have been boiled and water logged and miserable. But like the slow-cooked methods I have tried, the roasting intensified the broccoli flavors and the edges touching the pan had a caramelized crisp. Together with the sweet shallots and creamy potatoes, I was more impressed with every bite. And then, because a dish of chicken fat coated vegetables was not enough, I mixed up a quick aioli of mayo, lemon juice and a dash each of sweet chili sauce and our friend’s Ghost Scream hot sauce. Holy cow. What a dish. I am inspired to continue the trend and not have to run amok when I get home before dinner and have piles of dishes after dinner. This entry was posted in Chicken, chinese, Japanese, Mexican, Soulful & Simple by Marina Chotzinoff. Bookmark the permalink.